View my links page for a varied assortment of interesting links, -not all art related, but cool! I was commissioned by Quarto Books to paint a several watercolor step-by-step paintings for watercolor books. 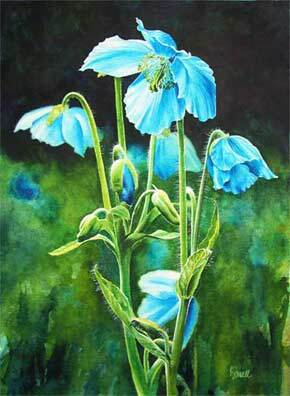 They provided the image to paint from, and this Himalayan or Blue Poppy was not my first choice. However, it is now one of my favorites. It was a joy to paint, especially when at the end of the painting I got to paint the little filaments on the stems (see enlarged image). The painting is copyright Quarto Books, and is published in How to Paint Watercolor Flowers: Create Your Own Masterpiece in 6 Easy Steps. It is now available at Amazon.com.